Our Perfectly Ripe nectarines are sweet and juicy, delicious eaten just as they are or cooked very lightly. Try serving with a slice of Parma ham for a lovely summer starter. 1. Place the honey, vanilla pod and 200ml water in a pan and gently bring to the boil. Stir in the whisky and remove from the heat. 2. Place the halved nectarines in a heatproof bowl and pour over the hot liquid. Leave to cool then chill for at least 4 hours or up to 24 hours. 3. 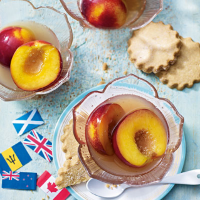 Spoon the nectarines and the sousing liquid into 4 small dessert bowls and serve with the shortbreads. a hot griddle pan for a minute or so until bar-marked before pouring over the hot liquid. This Asti is a great choice to complement the nectarines. It’s light, sweet and deliciously refreshing – plus it’s fizzy! This recipe was first published in Tue Jun 17 12:28:00 BST 2014.